This classic waffle recipe is going to knock your socks off. Just by the look of it, these are just perfect waffles made in a standard waffle maker — but this is where I have you fooled. As an ambassador for GoodCook, I was thrilled to find out I can bake my waffles in batches instead of having to deal with a waffle maker! Need More Breakfast Ideas? Check Out These Recipes! 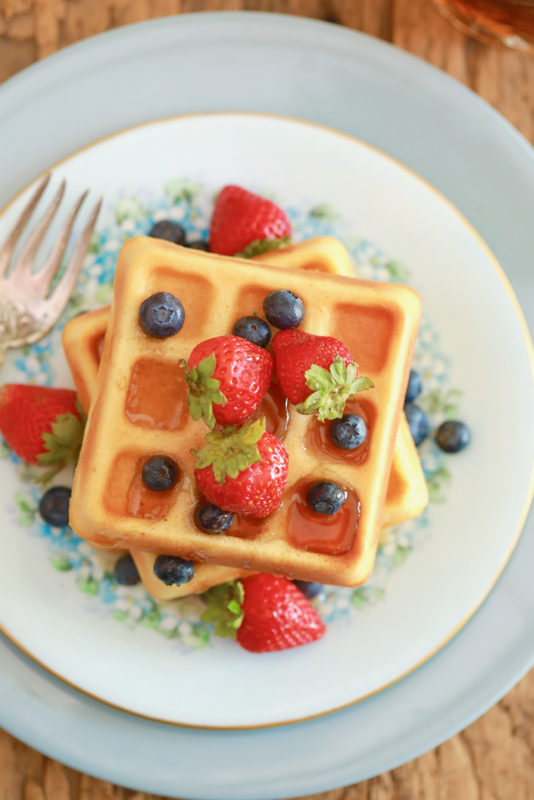 Get the full written recipe for How to Make Waffles Without a Waffle Maker on GoodCook.com! Can I use a muffin tin to make these? I don’t have the money for a new pan. It will not come out quite the same, i suggest you use the tin i linked in the recipe for the same result. Enjoy! Can I use buttermilk in this recipe or even double the recipe and use regular milk as one half and then buttermilk as the other half? Yes, you can do either. Buttermilk will work here too. Here is a laugh, I have a waffle maker but I am giving it away. So easy to make the waffles using the oven and you get more and can keep warm in oven too. Thanks for the nifty ideas. My kitchen is thinning out and becoming more efficient. Yes! I get it, we do hold a lot of ‘stuff’ in our kitchens, always great to be able to thin things down! I go through these moments too, if I do not use it for a year, I let it go, it is liberating! Haha! the problem is that I then cannot remember where it is! You are just great and I love watching your videos . Easy and delicious! We really enjoyed them. Thank you Gemma! They worked like a charm in that pan too! This will be a go to recipe from now on. This recipe sounds great!! My birthday is next week and I want to have waffles. Waffles with ice cream are one of my favorite treats and I love to celebrate my birthday eating them. I usually use my waffle iron, but this pan looks great and I want to try your recipe using this pan. However, I went to Amazon Prime and they said it ships in 1-2 months with a ship date of 10/17-11-2. I searched all over the internet via Google and I did not have any success locating this amazing looking pan. Please advise. Did you follow it through to the order point, or are you looking at the first point of contact on the page? Follow it through, the indicated time may change as it can be based on the longest time, depending on where it is shipped to. I will follow it through with the company to see if I can figure it out. You were right and the pan was delivered much sooner than Amazon said. I placed the order on10/1 and I received it today. I’m so excited to try this new way of making waffles. Thank you for letting me know, I am delighted you are all set to get baking these waffles. I love the crispy, crunchy outsides of waffles and the soft centers. Can you get that using these waffle pans instead of a waffle iron? Yes they do get crisp and are soft in the middle. It’s a great alternative if you don’t have an iron. Great pan. Love the versatile waffle. I would make a gingerbread one or chocolate one to serve with vanilla ice cream! Mmmm!!!! Yes! great ideas, thank you for passing these on. I have a few recipes here to get you started (https://www.biggerbolderbaking.com/?s=Waffles). Can you suggest egg substitute for this recipe. I think apple sauce or even banana would work well. Lovely! Finally we’ve found a way to make waffles without a waffle maker!! Will definitely give this a try..